Twitter chats have become very popular. But popularity comes at a price. Besides the large number of tweets streaming by, you end up with spammers spamming the hashtag and other unnecessary noise. In the early days, with fewer participants it was easier to engage in quick multi-tweet conversations to dig deeper, or gain clarity, around someone's point being made. In my experience lately the large numbers of participants make that quite difficult resulting in a stream of one-liner tweets simply trying to one-up the next. And while many people find that to be the most enjoyable part of a twitter chat, I prefer a more personable setting. Something with the pacing and question format of a twitter chat, but the intimacy of a video conference. A G+HoA is a live video conference with up to 10 participants in video chat room setting. Think of it as a virtual dinner party. Or a virtual happy hour gathering to watch a sporting event. Or better yet think of it as an over flow room with a video feed of the main room. Only instead of having only 140 characters to communicate you can talk amongst yourselves and share your twitter chat experience together in a virtual small group setting. Some have put forth the idea of doing a G+HoA right after the twitter chat as a sort of recap. It's an interesting idea, but it doesn't solve the problem of desiring a more human connection DURING the twitter chat experience. After 4 weeks of testing the idea, I've found that doing a G+HoA during a twitter chat more than provides the engagement I'm looking for. How Do We Define a HangChat? I wasn't planning on calling it anything, but the term just popped up mixing the 2 experiences and it stuck. So let's keep it. But what exactly is it? Well, I think the best definition was tweeted recently. Yes! A HangChat, as I have experienced them, is exactly that. And as I reflect on my experience, I see no reason why there couldn't be many different HangChats occurring simultaneously around one twitter chat. It's an enhancement and extension of the twitter chat experience...nothing more. What Makes for a Good HangChat? Excellent, quick on your feet, facilitation skills, would make for a great HangChat leader. Of the 4 HangChats I have run I can honestly say I did a TERRIBLE job facilitating. But it's an experiment and we're testing it out in the open for all to see. My failure as a HangChat facilitator does not immediately negate a HangChat's usefulness. I've enjoyed them even when I'm running them poorly. And the first 4 weeks of participants have enjoyed them as well. It's a learning experience. It's what I do...what we do. So, we'll continue to experiment until we find a process that works for everyone. 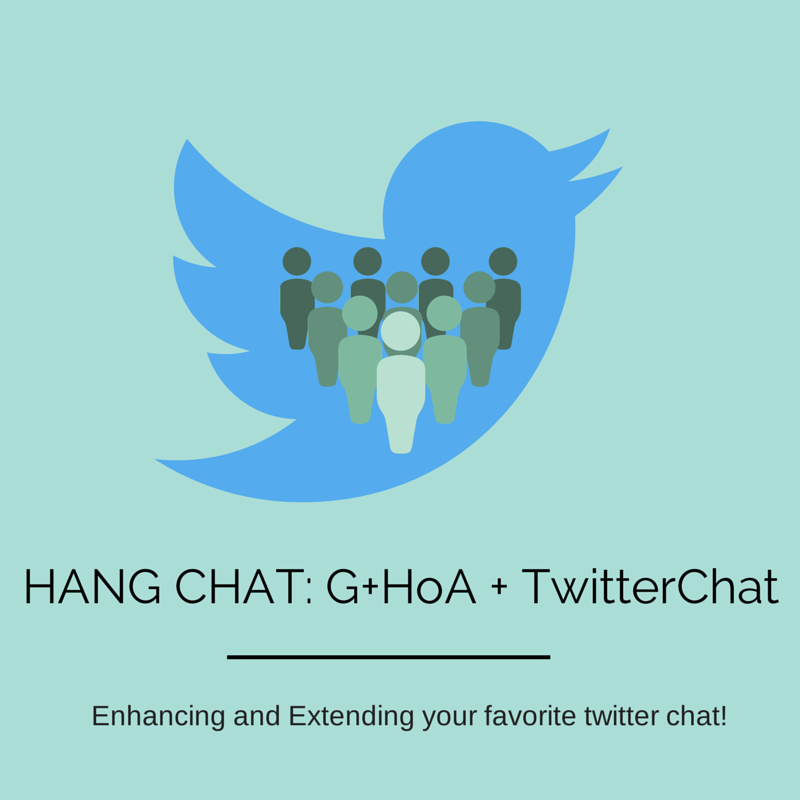 The small groups participating in the G+HoAs do not benefit by "hijacking" the twitter chat conversation. Without the twitter chat the hang chat does not exist. So, it doesn't make sense for anyone, or any entity, to remove the value inherent in the twitter chat. As mentioned earlier, the goal is to enhance and extend. Social Media is Only What YOU Make of it! The beautiful nature of social media is that it can be whatever YOU make it. It's still the wild west. There are no rules. Except of course for Cammy Bean's ultimate rule of "Don't Be an A******." That still stands. But seriously, there is a reason why there are memes like "Work out loud", and "Show Your Work". It's because with the internet and social media we CAN, so why not? Will you open yourself up to criticism? Absolutely! Will you feel vulnerable at times? Yep, that too. Do you need any special skills or permission? Nope. Have at it. But above all have fun and learn something new! So... if you have any interested in just trying out a HangChat, ping me. Find me on G+, or Twitter (@bschlenker), and let me know you'd like to join us. If my 10 spots fill up before you contact me, I'll encourage you to start your own. I'll even walk you through the process. It's fun! We'll learn together as communities of practice do.